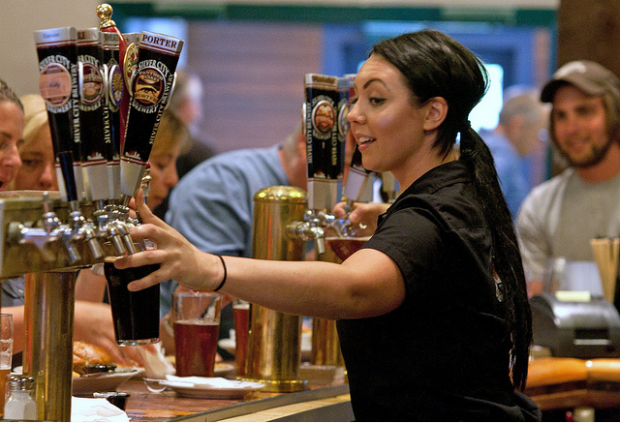 Megan Moran pours two beers for a Tuesday night crowd at Silver City Restaurant and Brewery. 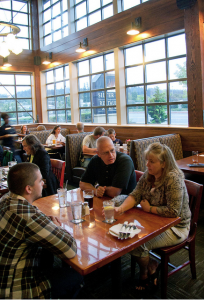 Brothers Scott and Steve Houmes, sons and grandsons of restaurateurs and former owners of Top Notch Burger restaurants in Bremerton and Silverdale, opened Silver City Restaurant and Brewery in 1996. Last year, Silver City opened its Bremerton brewery to expand its beer-production capacity and increase restaurant seating in the space formerly occupied by brewing operations. As part of my work on Kitsap Sun’s upcoming restaurant guide (due out in October), I interviewed co-owner Scott Houmes. A portion of the Q&A will appear in the guide, but Food Life readers get the full, uncut version. Well, uncut except for the parts where I didn’t type nearly fast enough (or forgot to type as I listened) and consequently portions of the conversation were omitted. How did you and your brother decide to start a brewery? We decided it was a good fit for Kitsap County. It’s something that we had a passion for as far as the food industry and great craft beer. We thought at that time that Kitsap County was ready for it. How did you meet brewmaster Don Spencer? We went on a recruiting trip for a brewmaster. We knew that brewmasters were kind of a brotherhood, so we took a tour of Thomas Kemper [which formerly brewed in Poulsbo]. We wanted to meet a brewer and put the word out there. In 1996, they didn’t have Monster.com or any of those things, so we were doing it the old fashioned way. … We took a tour with Don Spencer and after the tour, we took him aside and said this is what we were doing and if you know anyone, spread the word. Luckily, Don didn’t tell anybody and we ended up hiring him shortly after that. Being a brewmaster is a pretty coveted position. He was able to come in and create his own recipes and styles and brew what he wanted to brew and brew what Kitsap County would like. About 50 additional seats have been placed in the area formerly occupied by the brewing operation. Good. We have a good following. We just finished an expansion that we’ve been working on for the past eight to 10 months. Our business grew and grew every year since we opened in ’96. In the past five years, we’d have a waiting a line at the door every week, and we knew we needed space for more guests and our beer was becoming more and more popular so we took the brewing operations from the site… We have a production brewing facility down in in Bremerton and we’re now distributing our beer throughout Western Washington. We were able to open 50 more seats for our guests and eliminate the wait for our tables. After 15 years, you still have steady business and a social media following most local businesses could envy. What do you think has kept Silver City so popular? I think being a brewpub or this style of restaurant and brewery lends itself to having more of a neighborhood feel, a place that the community can call their own. The beer is brewed in the area … a lot of people have learned about craft beer through Silver City. It’s not just part of another chain. It’s a locally owned place that they can feel good about, that’s the first thing. And No. 2, we have a great staff with a great level of service, second to none and we offer a great selection of food that you can come and eat in any attire … with flip-flops or a tie. You moved brewing operations to Bremerton and expanded the restaurant in the vacated vat space, how have the changes gone? It’s gone over great. It’s given the operation a lot more space for the guests. The wait time has been reduced and it’s expanded our brewing capacity. We’re able to produce more seasonal beers on a consistent basis, give more variety for our gusts and it gives a better flow for the restaurant. One of the main things our guests would always comment on was a long wait for a table and it was cramped quarters in there. …Having people hungry and standing in line for 45 minutes is not something anybody wants to do. When are you going to open a tasting room at the brewery? That’s a good question. With the growth of the distribution business, it’s kept me on my toes. We’ve darn near tripled our production from what we had four years ago, so we’ve been busy with that and busy with remodeling the restaurant… The type of business we can open up down here is limited because of lack of parking in our industrial area. You can’t open a 50- to 60-seat restaurant with 15 parking spaces, so it will be something more like a tap room with a lack of food. If we can’t get them someplace to park, they won’t come. The biggest excuse is: it’s been a matter of time. We have had it open for keg sales and bottle sales out of the brewer since the first of January. We sell between 20 and 30 kegs a weekend. People can go down there and pick it up? They can call ahead and order and we make sure its ready nine times out of 10 for the weekend. What beers do you have under development? As in new? We have our year-round beers, our most popular being Ridgetop Red and the Fat Scotch Ale, our Indianola Pale Ale, the Panther Lake Porter and our Bavarian Hefeweizen and Whoop Pass IPA. We also have beers that we like to have our seasonal beer rotation and right now, we have our Oktoberfest … We’re one of the few that brew a traditional Oktoberfest lager. Our next seasonal lager will be our winter bock, which we’re very excited about. When will (the winter bock) be out? That will be out the beginning of November. Is this the first year for the winter bock? We brewed it on an annual basis at the brewpub, but now as far as distribution, this will be our first year. Our seasonal beer this summer was a Ziggy Zoggy and it was very successful. It’s a great summer, easy-drinking beer with some honey notes to it much like a summer pilsner but very sessionable. … I don’t know if you’ll find that in the dictionary. What we mean is that you can drink them in succession. Tell me about menu changes over the years. Basically the guests have helped determine our menu over the years. We re-order the fresh sheet on a rotating basis. We bring out new items on the fresh sheet, an appetizer, several entrees and a dessert. They coincide with the season. For the fall, we have bratwurst and schnitzel. In the wintertime, you’re going to have more of hearty dish and such. With those items, depending on how well they’re received and how well they sell determines what goes on the menu in the future. We can’t just keep adding to the menu, though, to keep the flow of the kitchen and the restaurant. 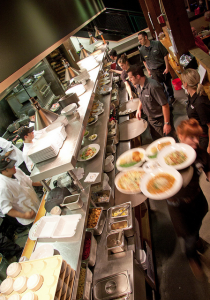 … Some restaurants just have a huge menu, and order to do what we do, we keep the food fresh. We just can’t offer a million different items. … Something like a schnitzel, where it would be very popular, it won’t go on the menu because its a fun thing to have every season. It’s nice to change to the menu, but it’s also hard because people get in the habit of having their favorite item. … You have to make those tough decisions. How do you decide which new beers to introduce? They’re all inspired by Don Spencer, our brewmaster. … Throughout the years, we’ve had up to 40 different styles. We have a small brewery here called our pilot brewery where we can brew two kegs of beer at a time, so it can start in that fashion, and we’ll put that beer on at the pub and see how it’s received. If the brew is successful, it would evolve into a pub series beer that’s mainly for the pub. We’ll brew 20 barrels, that’s 40 kegs, and that wil be on at the pub for four weeks or so. Based on the success of the beer, not only the sales but how it fits our lineup, will determine that. Some beers will be seasonal, but like the restaurant menu, you can only have so many brews year-round. Our brewery is getting larger, but it’s not that large. Do you home brew beer? No, my brother and I are restaurateurs. Since we opened the new facility, I’m more of an overseer of the brewing operations and brewing distribution and he’s more of an overseer of the restaurant. We come from a family of restaurant owners. Both my grandfather and father were in the business. My grandfather started a chain called Kings Table and my father joined it in late ’60s, early ’70s. They were part of growing it all along the West Coast. What’s your favorite beer and food pairing? My favorite, let’s see here. I would have to say my favorite pairing is a Ridgetop Red with our firecracker wings because a red is nice and sweet with nice caramel notes, and not overpowering, and the firecracker wings have a spicy ginger and garlic to it. Most wings are just spicy, but with ginger and garlic to our wings, its very unique. The spiciness slows me down so i don’t eat too much. Tell me about the best beer you’ve ever had and why it was so memorable. That’s a tough question … I’ve come to appreciate every beer for its own style. I used to be a real hop-head and say nothing was good unless it was an IPA or Double IPA, but the longer I’m in this business, the more I appreciate the number of styles there are and the number of flavors there are. My next favorite beer is the beer I haven’t had yet, and I’m going to ponder over. What’s next for Silver City? A lot of people have encouraged us to grow over the years. They say, ‘Open a restaurant in my town’ up and down the Kitsap Peninsula down to Gig Harbor and up to Port Townsend and Sequim. Growing up in this business. … What it takes is time away from our family and time away from a lot of our restaurants and it turns into a big battle. This business is hard enough as it is with one restaurant and one brewery. … We’re more content with ensuring our business in Bremerton and Silverdale do what we say we’re going to do as far as having great operations, great food and great beer rather than grow it and expand operations. We’re planning on making Silver City as good as it’s ever been if not better.